Today is the one-year mark from the 2020 Census reference date, April 1, 2020. For many organizations, it is the official launch date of their census campaigns. By this time next year, the Census Bureau’s massive outreach operation will be in full swing, and philanthropy is critical to this operation. FCCP’s Funders Census Initiative (FCI) of more than 300 grantmakers and PSOs is growing larger and stronger each week, thanks to your engagement. 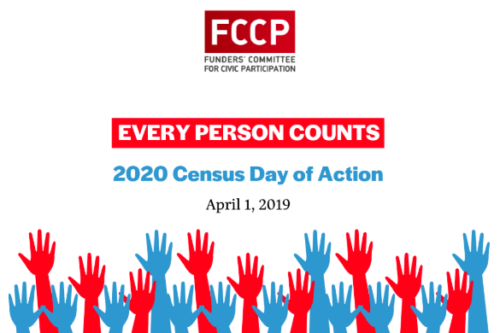 If you haven’t already, please join the FCI to connect, access resources and technical assistance, and mobilize for a fair and accurate census. FCI has been working for more than two years with our dedicated leadership team and our partners at the Democracy Funders Collaborative Census Subgroup and the United Philanthropy Forum to prepare for this essential work. Despite the unique barriers to a fair and accurate 2020 Census, we have seen unprecedented levels of engagement from the philanthropic sector to promote and protect this essential component of our democracy. For philanthropy, accurate census data are a vital tool for our work. They help us better understand the issues we care about and the communities we serve, create priority areas, and inform stronger evaluation. Without our shared effort, we put at risk the distribution of fair political representation across the country and more than $800 billion per year in federal resources. Foundations, their trustees, and grantees must be part of the effort to inform and mobilize all households to respond to the census. Without this effort, the communities and individuals we support will be further marginalized for a decade. Define the target audience for outreach: The list of potentially hard-to-count households will include those who may not be eligible to vote. Identify how to reach the target audience: Engaging trusted messengers, using digital tools, maps, and analytic tools to monitor progress, and integration of data into existing platforms will improve outreach. Make the “ask” of the target audience: Between now and the end of the year, there is a need for broad education and outreach efforts. Between January and March 2020, there will be a need to encourage households to complete the census form. Between April and July 2020, there will be a need to mobilize households that did not self-respond to the census. There is significant uncertainty ahead of us, from inadequate funds in the Administration’s FY 2020 budget request and incomplete Census Bureau plans to the citizenship question litigation and the extent to which fear and distrust will impact the count. Although philanthropy cannot and should not supplant the government’s responsibility to ensure a fair and accurate census, funder engagement in support of the census is more important than ever. We have the power to make a difference in the count if we act with urgency to support organizations on the ground that can make a difference. We hope you join us to participate, convene, and — most importantly — invest.